Last Monday we chatted about snacks - those tasty nibbles that keep our tummies happy at parties, while watching football, wrapping gifts or stealing a few precious moments to lose ourselves in a good book. Today, we're shining the holiday spotlight on the sweeter side of life. I don't eat a lot of desserts the rest of the year. In fact, I usually prefer salty to sweet but that preference seems to go flying out the window when December rolls around and my sweet tooth blossoms in all its chocolate loving glory. Unless, of course, the sweet chocolate is combined with salt. No way I'm walking away from that one! December. I begin early - the weekend following Thanksgiving - and usually continue until a few days before Christmas. There are packages to ship to family and friends far away as well as goody plates to deliver to neighbors and others who go out of their way to bring a smile to my days. I love getting creative in the kitchen and watching the smiles the treats elicit upon delivery makes my heart happy. It's a win-win! In a large bowl, thoroughly mix one cup powdered sugar with remaining ingredients. Sprinkle some powdered sugar onto a piece of waxed paper. With hands, shape mixture into 1-inch balls. Roll each in powdered sugar. 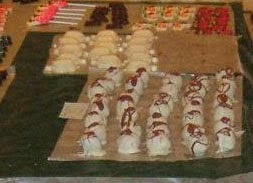 Wrap balls in plastic wrap or foil or store in tightly closed container. Melt milk chocolate in a separate double boiler. Stir peanut butter into melted white chocolate until smooth. Add melted milk chocolate and gently swirl. Pour into a waxed paper lined baking dish. Chill until firm. Pull out of dish using waxed paper. Cut into squares. Wrap in colored foil squares. Mix all ingredients thoroughly. Using a small cookie scoop, drop dough onto parchment. Bake 10 - 12 minutes until golden. Remove to cooling rack. * Can make ahead and freeze. Pat cherries dry with paper towels and set aside. In a bowl, combine the butter, corn syrup, unsweetened chocolate and cream. Stir in the powdered sugar. Knead dough until smooth. Roll into 18 balls; flatten each into a 2-inch circle. Wrap each circle around a cherry and lightly roll in hands. Place cherries, stem side up, in a shallow wax paper lined container. Cover and freeze for at least two hours. Remove cherries from the freezer. Melt white chocolate. Holding onto the stem, dip cherries in the white chocolate; set on waxed paper to dry. Melt semi-sweet chocolate. Drizzle over candies. * Undipped dough can be made ahead and kept in freezer until the day before serving. Knead dough two minutes on a floured surface. Roll dough to 1/4-inch thickness. Cut into shapes and place on an ungreased baking sheet. Bake at 300° for 30 minutes. Those are a few of the treats that come from my kitchen at Christmas. What treats are made in yours? Are you a baker or a buyer? Do you like your treats sweet or salty...or a combination of the two? What's the traditional favorite that your family insists on every Christmas? P.J. I am privileged to have been gifted some of your delicious chocolates and can certainly recommend them! I love the look of that Tiger Butter! That Tiger's Butter tastes even better than it looks, Kandy. Love the sound of those brownies. Anything with "triple chocolate" in the title has to be good! I love sweets! A dash of salt. I don't bake anything- I eat or buy sweets. I go to the candy isle and stock up on yummy cotton candy, fudge, bark, cookies, candies, ect... I make sure i try every kind of pie offered. Thanks! Sweets. But I do like dk choc covered pretzels. I usually make different cakes; this year I made a few eggnog cakes and they were good. Always make some cranberry loaves and some kind of chocolate cake for our Christmas dessert. I've been following you very closely on Facebook this past week and drooling over each of the delicious treats you have been making. I've always loved baking but I admit that I have slowed down on that somewhat. Our children/grandchildren don't live nearby so I have cut back on making these goodies. Heaven knows my husband and I don't need to eat everything I would love to bake. However, I've always made cutout sugar cookies using my mother-in-law's cookie cutters, some of which were made by my father-in-law. Fudge has also been a bit hit for Christmas too. I always made a double batch and shared it with my sister and her children. I've also made fruitcakes which I adore but seem to be the only one in the family who does. I am so happy to see people like you continue to make all of these wonderful homemade goodies. I wish more women had time to do that too. It creates such fun memories for the entire family. Connie, I think my family would disown me if I stopped making them! I've been baking up a storm the past week so I can get packages into the mail to the scattered family members. Things will slow down after Wednesday though I'll still have some things to make for my local goody packages. Mary D, I'm not familiar with sponge candy. Will you tell us more about it? I like to make fruit cobblers. Don't do much baking as I am an older lady, but can whip up small cobblers. I do love to cook though. Thanks for the giveaway. My daughter and I share books; so this would be a nice gift to share after I am done reading the books. Merry Christmas to one and all. I love fruit cobblers! A former neighbor made the best blueberry cobblers with fresh, handpicked berries from a local farm. So very good! About the only times I bake these days are Christmas and Easter. This year I'll bake sugar cookies and what the oldest grand christened "Cosmetic Christmas Brownies" (just frosted brownies decorated) for the grands. We are having our big family Christmas celebration Saturday, and I'll make pecan pies and lemon pound cake for that. That's less than usual, but one of my nieces loves Christmas baking, and I'm ready to pass the torch. Love the "Cosmetic Christmas Brownies." What a fun title! I'm willing to bet your pecan pies and lemon pound cakes are in great demand! I am not a baker or candy maker. My mom and dad used to make peanut brittle and 3 kinds of fudge every year at Christmas. Now that she is gone he doesn't enjoy doing it by himself, so we just buy what we have a craving for at the time. How delectable and delightful. I enjoy our traditional apple cake. I am not a real baker but this time of year try to create a festive and creative array of goodies. Your talent is wonderful. Great creations. I would love to be able to make fudge and brownies for all. Thanks! My brother is the fudge maker but I do enjoy making brownies. A local morning TV show had a 3-ingredient recipe for brownies made in mini-muffin pans. I think I'm going to try it. I use to bake but once the children were out of the house I did it less and less (the two of us don't need all those sweets lol). So usually I buy something from the bakery (especially for sunday dinners) and then I send them home with the kids lol. This year my one daughter made chocolate covered nut clusters in the crockpot!!!! They were wonderful but I'm afraid I don't have the exact recipe but she said they were really easy - mostly just a combination of nuts (salted and nonsalted), different chocolate, peanut butter chips and viola! I also love chocolate covered pretzels - sweet and salty. The Tiger's Butter sounds great! I used to bake and candy-make like that long ago. I do like to make shortbread, Danish Puff, and Maple Nutty Bars. I like my goodies to be a mixture of salty and sweet, for the most part. Neighbors are surprised when I take them a plate of something. I love shortbread but I've never found a really good recipe so that's one item I usually end up buying. Would you be willing to share the recipe for the Maple Nutty Bars? I love anything with maple! PJ! I watched all those pics of your goodies last week and drooled all over my keyboard! But I have to get this extra weight off, so I made Molly Approved dog treats for my friends' doggies this year. It's a recipe from Publix and I posted it and a pic of Molly on tsu. I'll have to try your treats for Molly next - I like making homemade treats for her without all the preservatives. Merry Christmas! Thanks for the recipes! I'll check out the recipe on tsu. Always looking for good homemade treats for Rachel. I miss having family here to help with the tree. It's a lot more fun when done as a group. Hope you have a lovely Christmas! One family favorite is Congo Bars, a wonderful brown sugar/chocolate chip bar cookie. The recipe is below. Thanks for sharing some recipes--but how about the one for Turtle Bark? Merry Christmas! The Turtle Bark is easy. Melt milk chocolate; spread a layer on a waxed paper lined baking sheet. Let cool slightly. Drizzle melted caramel over the chocolate and sprinkle with toasted pecans. Pour another layer of melted chocolate over the caramel and nuts. Spread to cover entire sheet. Sprinkle with chopped pecans. Chill in refrigerator. Break into pieces and enjoy! When using store-bought caramel, I prefer to buy it by the loaf. I've used Nestles in the past but my current favorite is the loaf from Chocoley.com. Great service and excellent quality! Melt the caramel in a double boiler or in microwave over low heat. If microwaving, heat in 30 second intervals, stirring after each interval until completely melted. Thanks for the recipe! I like Congo Bars! My mom has a secret sugar cookie recipe that I love. I'm a buyer, I like sweet and the sugar cookies are what everyone in my family insists on every year :) Thanks for sharing! I like sugar cookies too. Several years ago, someone gave me a recipe that included lemon extract. It gives the cookies a little extra zing that I really like. My favorite was always Sweetheart (aka thumbprint) cookies with a dab of raspberry jam, and because that recipe called for egg yolks we used the eggwhites to make Forgotten cookies (ie Meringue) with chocolate chips. Ooh, I like the sound of those meringue cookies with chocolate chips! Making and decorating sugar cookies is a must. I make them every year with my grandchildren just as I did with my children, even though they usually desert me about half way through the baking process. : ) My husband loves fudge so I'll attempt to make fudge as well. PJ, what a fabulous post! Thank you so much for the recipes! I am also a sweet-plus-salt lover. There is a chocolate bar I find just every now and then at the grocery, and it's got bits of coarse kosher salt stirred into it, so you bite into the bitter, dark chocolate, and you get one of the little salt cells for a salt hit on your tongue, and OMG, it's an amazing treat with a glass of red wine. I'm a baker, but not candy. I make my grandmother's (1920s recipe) German Chocolate Cake for holidays, and I make pumpkin pie and such. I've never gotten good at the baking for giveaway tins, and I really want to. Yes, it takes some time, but there is no substitute for what's made with love, and I find that people will accept that, when they would not necessarily accept something you'd bought. Cassondra, I know what you mean about the salt. Divine! The dark chocolate-coconut-pecan bark I make has sea salt lightly sprinkled over the top and the turtle bark as it as well. It really makes the flavors POP! Thanks for the recipes, PJ, especially the doggy treats! I can't wait to make them for my pup! We like the sweets here. I'll be making family favorites - frosted chocolate cookies, chruschiki (a Polish holiday cookie), spritz cookies, rice krispie treats, and saltine toffee. I haven't make the saltine toffee in years. It's good, isn't it? The main one that HAS to be made every year is the Chocolate Raspberry Walnut Fudge. It's the recipe on the marshmallow creme with an extra handful each of chocolate and marshmallows, an extra splash of vanilla, some raspberry extract or candy flavoring (depending on what I can find each year) and close to twice the recommended amount of walnuts. We also do a ton of pies and cookies. I love to bake and Christmas is my favorite time to splurge and make multiple amounts when I'm baking to share with my friends and neighbors! I must admit that the long they want me to make the most is cherry covered cheesecake but I can't tell you the "secret family recipe" but I can give to a hint of how I make by letting you know that I use crushed Ziebach on the bottom and sides of the pan! I've learned that no matter how many I make I've don't eat them myself because I'm a juvenile Type I diabetic but I love seeing everyone else enjoy a very special "sweet treat"! Can't believe I just erased my comment : ( This will be shorter. We don't bake like we did when the kids were at home. I did Teddybear yeast breads for all their teachers every year. I usually do apple bread for coworkers. For cookies, we did bourbon balls (a different recipe than yours. ), gingerbread, sugar cookies, toffee bars, my grandmother's filled cookies, and Swiss Merengue Horns (these are relatively light and delicious. They are a bit of work, but elegant. Whenever we had a party, I would make them. The recipe makes 10 dozen.). I usually make apple, pumpkin, and mincemeat pies. My grandmother always made apple cake at Christmas. I loved it so much! Those Swiss Meringue Horns sound delicious! I always made mincemeat pie when my dad was alive. It was his favorite (he was the only one in the family who liked it) and a special treat I could make just for him. I love mincemeat pies, but no one else in the family is crazy about it. I use the None-such mix and add diced tart apples, walnuts, and brandy. I love to bake! My sister came down over the weekend and we made cheesecake bars, cake truffles and a creamcheese pie. I don't bake as much as I used to but I do enjoy it. The recipes above look great and I will point them out since she is in charge of baking this year. I am going to her house today and we are doing a bunch of baking. Butter cookies are my favorite and I hope they are on the list. I love sweet and salty. Love chocolate! Each year is different for me. Last year I was in the mood to bake quite a bit and I made several batches of cookies and candies and did the packaging and gifting thing. My favorite standby is a very simple candy recipe. You melt chocolate and butterscotch chips and stir in red-skinned peanuts, plop them on a cookie sheet and stick them in the fridge until they are hard-- they're delicious!! My son loves the peanut butter muffin cookie with a mini Reeses peanut butter cup on top. So glad I saw your post today. Might just be the motivation I need. Crush candy canes (makes about ¾ cup of candy pieces). Place candy coating in a microwave-safe bowl. Microwave at Medium (50% power) for two minutes, stir. Cook an additional minute or two at Medium, until coating is melted. Stir in candy and spoon mixture into paper petit four or candy cups. Chill until firm. Store in an airtight container. Makes 3 to 4 dozen candy cups. My favorite dessert to make is chocolate cream pie. Everyone loves a pie with real whipped cream. I love just about all desserts by the way. The only cookies I make are the slice and bake so I am definitely buyer and eater and not a baker. LOL I do appreciate everyone else's creations. Scanning the blog and these sweets surely look good. I just may make some.